Topps has announced that the 2015 Bowman Baseball Lucky Redemption will again be a young star for the Chicago Cubs. 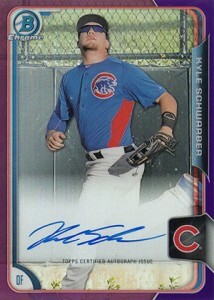 Collectors who pull the Lucky Redemption card from 2015 Bowman Baseball will receive an on-card autograph from Kyle Schwarber. Schwarber's new teammate Kris Bryant received the honor last year. 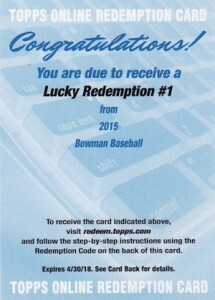 Shop for 2015 Bowman Lucky Redemption cards on eBay. Kyle Schwarber was the fourth overall pick by the Chicago Cubs in 2014 and made his major league debut in June of 2015. After returning to the minors for a brief period, he rejoined the Cubs at the end of July and has performed well. Although a card image was not provided, Topps revealed that the Schwarber card will utilize the 2015 Bowman Paper Auto Prospect design with an on-card signature. The actual image will be from the 2015 All-Star Futures Game where he was named the MVP. Schwarber also has a live autograph in 2015 Bowman that is part of the Chrome Prospects Autographs insert. The purple parallel of that card is shown below. Before the announcement, the 2015 Bowman Baseball Lucky Redemption cards were selling for around $300. Check out the key cards currently available for Kyle Schwarber in our detailed prospect guide. 2016 PANINI BASEBALL BLACK FRIDAY PACK KYLE SCHWARBER PATCH JERSEY #9 10 MADE! 2014 Bowman Draft #DP2 Kyle Schwarber ROOKIE BGS 9.5 GEM MINT Cubs ! !